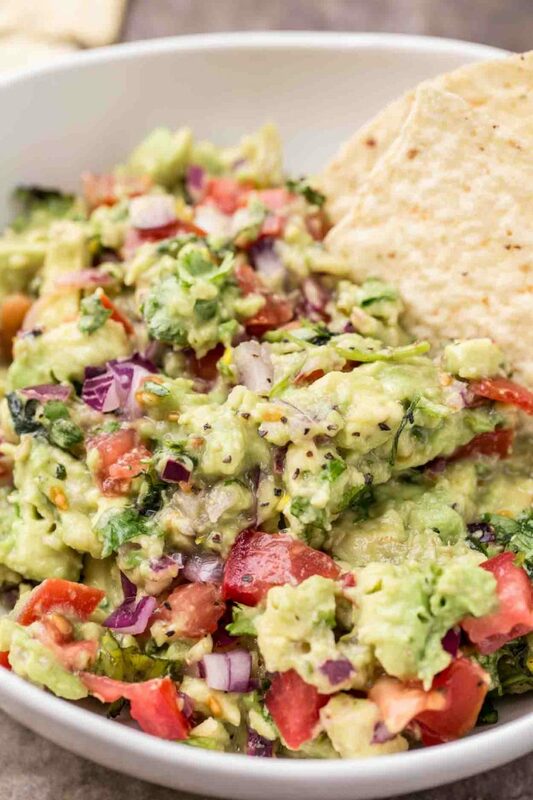 An authentic chunky Easy Guacamole Recipe using basic ingredients with amazing results. The homemade Mexican inspired dip is so healthy and the perfect side for any dish, especially fajitas and quesadillas. The salsa is great to serve at parties with chips or vegetables. We love guac so much we even serve the salsa over baked salmon – so good. This simple guacamole is truly the best guac using fresh ingredients! 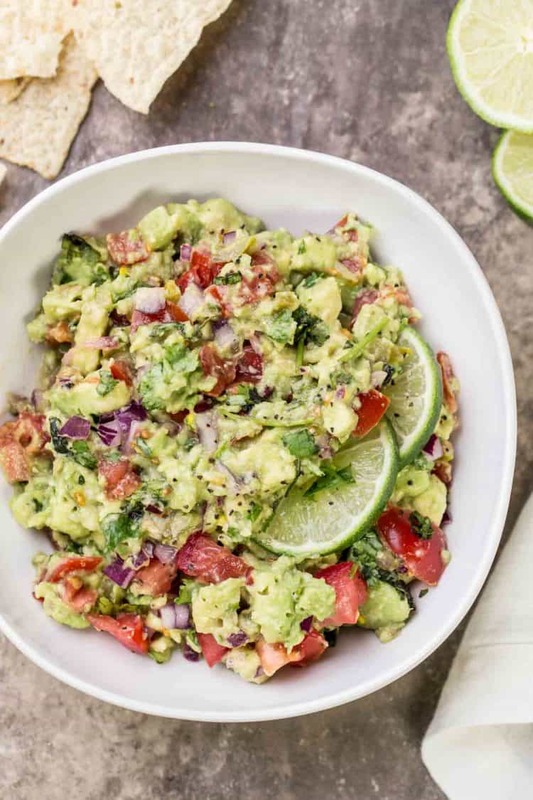 Chunky avocado pieces with tomatoes, red onion, cilantro, the perfect “spicy” factor from jalapenos and garlic, and fresh lime or lemon juice to finish the guac. The salsa is smooth but chunky and so addictive! It has the perfect amount of flavor in every bite. Once you try it, you’ll want to make it over and over again! SO EASY and DELICIOUS! Since avocado is the main ingredients in guac, it’s packed with nutrients and good fats, making this dip a guilt-free side. Avocado being a superfood, it makes the guacamole not only tasty but so HEALTHY. Making this guacamole recipe is so so easy and quick. If prepping in advance, cube everything but the avocado. You want to cube the avocado right before serving. Cube the tomatoes and mince the garlic. Finely chop cilantro, onion and jalapenos. In a bowl combine all of the ingredients for the guacamole. Though guac is most often associated with chips and vegetables, there are other unique ways to serve and enjoy guacamole. Over toast plain or topped with an egg. Load it on a baked potato. On a sandwich instead of dressing or mayo. On a burger… with bacon! As a dip for french fries. Like the classic Buffalo Chicken Dip, salsas and dips are a must for any party, potluck or family gathering. They help get everyone around the table and are so versatile when serving. We always try to have a few different varieties of dips to serve at parties. Creamy Crab Dip– served cold. Hot Crab Dip– creamy hot cheesy crab dip. Salmon Dip– smoked salmon + cream cheese, perfect. Buffalo Shrimp Dip– seafood dip with a kick. how to make guacamole last longer? 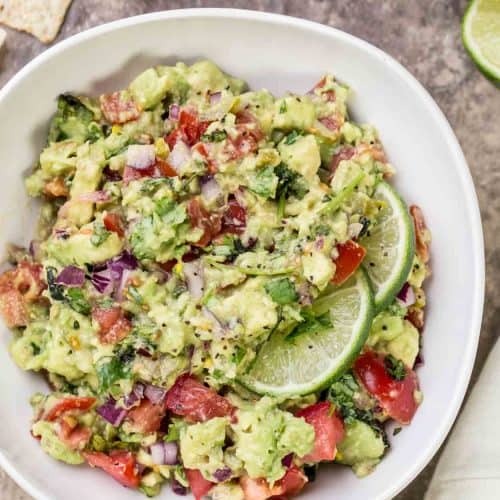 Avocado is prone to browning quickly because the enzyme in avocados cause it to oxidize when exposed to air, so guacamole is best if enjoyed immediately. If you have leftover guacamole though, be sure to seal it tightly keeping oxygen out. Add plastic wrap directly over top of the dip and keep covered in an airtight container refrigerated. It’ll stay fresh until the following day, discard any browning on top of dip before serving. An authentic chunky Easy Guacamole Recipe using basic ingredients with amazing results. This Mexican homemade guacamole is perfect with chips! Cube tomatoes and avocados. Finely chop onions, jalapeños and cilantro. 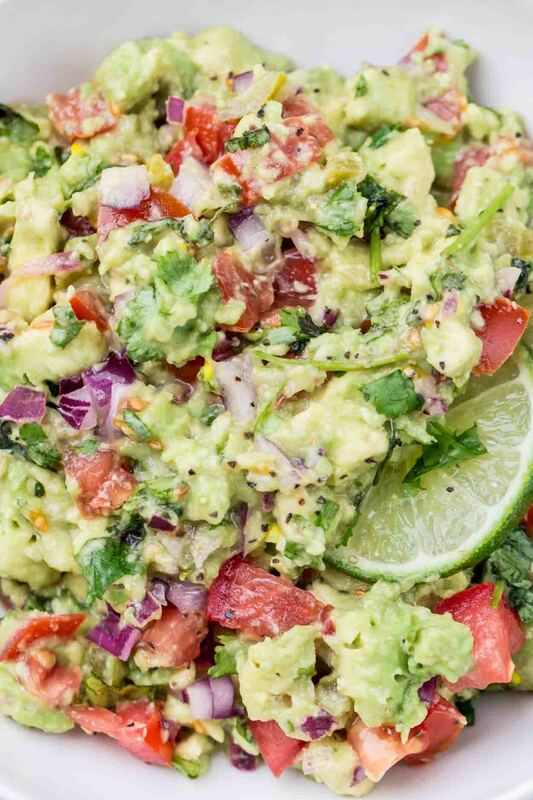 In a large bowl combine the tomatoes, avocadoes, onion, cilantro, jalapenos and garlic. If a smooth consistency is desired instead of chunky, mash with a fork. Drizzle with lime, lemon and season with salt and sugar. Mix to combine. I could eat the screen looking at your delicious guacamole!!!! Will try!! Love your blog, keep the recipes coming Valentina!!!! You just totally made my day, Lily. 🙂 I’ll take that as photography gone right, ha! 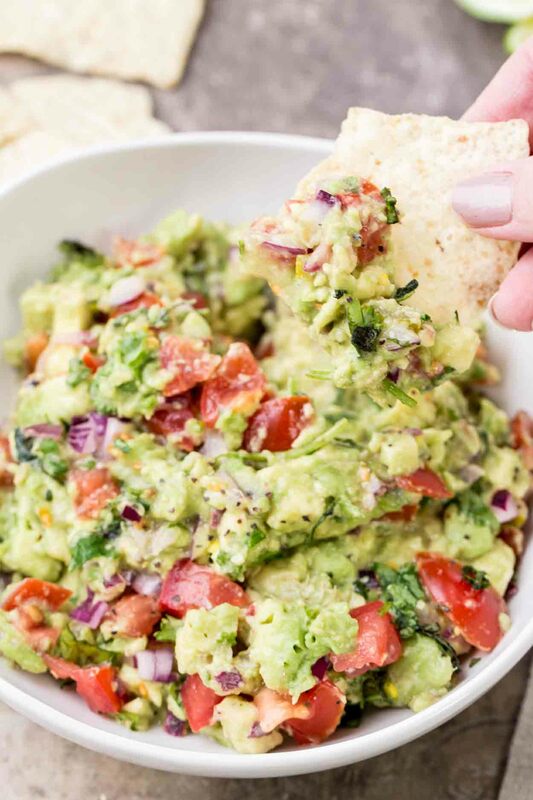 Thanks for visiting our online home and trying our recipes, enjoy the guac.